Do you have large amounts of data that contains information and value that is not currently being leveraged? Wouldn’t it be great to have an easy-to-use solution to maximize the revenue of every pixel and polygon in your database? ERDAS APOLLO Advantage allows for users to go from the “scanner to the shop” in one day. 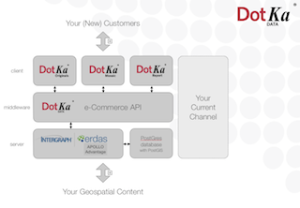 This solution automatically crawls geospatial data and reads applicable metadata into a catalogue with web services on top. In addition, the Store Front can ingest non-geo data. Adapted for old aerial photographs, when digitized, the system requires the administrator to copy the raw data to the server to be crawled. From a central data repository users can now provide a print to a consumer and a PDF report to an environmental consultant simultaneously through various web shops with multiple propositions. Fortunately, the Store Front offers payment and subscription solutions for businesses and consumers. This enables both enterprise-level usage, as well as the ability for consumers to purchase and access high-quality photo prints via a bank or credit card. The Store Front automatically manages users, orders, deliveries, payments and business reporting. It includes a brokering option, with the ability to track 3rd party data offerings and remittance. The system also has a customer portal to store and manage all administrative information for any user to access depending on their role. Order details, order status, user details, invoices and more are accessible – minimizing the need for cumbersome paperwork. The Store Front enables geo-RSS, where users can subscribe to a location or area, and the system will automatically send notifications when relevant new data is available. With this geo-marketing tool, organizations can let the system connect users to recently acquired data, and automatically inform them with personalized emails. Sectors offering consumer goods, e.g. 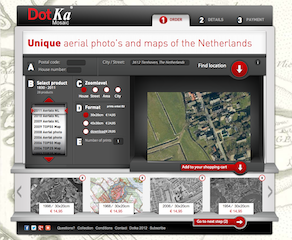 Dotka Data has developed an Imagery archive with 400.000 aerial photographs, accessible in 3 webshops. This operational system has been extended to a generic API, and is available as Store Front to ERDAS APOLLO Advantage software from Hexagon Geospatial. The Store Front API includes three webshop templates for accessing data as original photos, mosaics, geodata or PDF reports, available as prints and downloads. All products can be delivered as digital download and high quality prints. The API connects to any Print Shop Partner using XML. The API connects to any Payment Service Provider, such as Ogone. These shops are available as template, to quick start your own shop distributing any data, served by a powerful data management solution like ERDAS APOLLO Advantage. 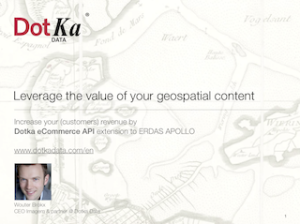 The Store Front API is the first API enabling fully automated solutions based on large geospatial data stores, to . With ERDAS APOLLO as data management solution and powerful engine robustly serving previews and products, your customers – and your customers’ customers – can instantly access your valuable content online.